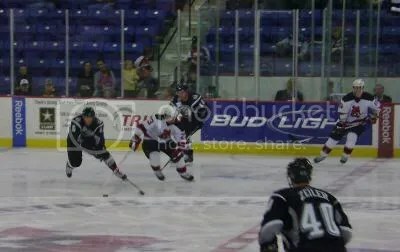 LOWELL, MA- The Manchester Monarchs traveled south to Lowell to take on the Lowell Devils at Tsongas Arena Saturday afternoon. The LA Kings affiliate brought with them some loyal fans who filled in amidst the home crowd. In net for Manchester was Jeff Zatkoff, and for Lowell, Jeff Frazee. The first period was largely dominated by Lowell at least overtly. Lowell spent a lot of time in the Manchester zone though the Monarchs had their opportunities. In fact the Devils managed several steals in Monarch territory to produce opportunities including by Jeff Prough. Early on Vasyunov had a shot in but Zatkoff denied it. Vladimir Zharkov added some shots as well. The Monarchs got on the board first when Andrei Loktionov scored at the 4:12 mark assisted by Moller and Holloway. The Devils however responded quickly and Stephen Gionta scored assisted by Vasyunov and Magnan at 4:41. The first penalty of the game came at 4:58 when Juraj Mikus was called for slashing. The Devils would capitalize on the Power Play when Michael Swift sent the puck past the keeper assisted by Perkovich and Taormina at 6:08. Despite being down 2, Zatkoff came up with multiple saves as Lowell kept up the attack. The Monarchs went down a man again though when Elkins was called for hooking at 8:28. Murphy sent a shot in, but it was saved by Zatkoff. Later he made another key save despite a Devil being all over him in the goal area. Shoving not unexpectedly broke out as the game grew tenser. Louis Robitaille and Palmieri also had their chances on net, but Zatkoff stood in the way and the Monarchs successfully killed the penalty. Michael Swift got the puck point blank and shot it, but Zatkoff stopped him cold. At about the 13 minute mark in the period Lowell had 14 shots, and Manchester only 3. Lowell’s first penalty came at 13:30 when Palmieri was put in the box for hooking. On the power play attack Alec Martinez found an open angle, but the puck didn’t get in the net, and Moller had a point blank shot that was also stopped. Lowell survived the penalty and with 4 minutes left in the period, it was still Lowell with 16 shots and Manchester with 4. Manchester did pick up a few more shots before the period and Gionta was put in the box for tripping at 19:24 giving the Monarchs an opportunity to start the second frame. At the end of 1 it was Lowell 2, Manchester 1, and they had 16 shots to Manchester’s 7. Period 2 opened with Manchester on the Power Play, including shots from Martinez and David Kolomatis, but now points resulted and the penalty was killed. Gionta later nailed Kolomatis during game play, and at 2:11 mark, Elkins was put in the box for Hooking giving the Devils a power play. Murphy let a few shots fly as did Magnan and Vasyunov, but the visitors killed the penalty successfully. Marc-Andre Cliche added a shot and Mikus missed an open net as well during the Manchester attack. The Devils were on the power play again at 6:55 following a hooking penalty on Joe Piskula. Matt Taormina and Nathan Perkovich had some shots, but were denied by the goaltender. Drew Bagnall got called for hooking as well at 8:55 just as the first penalty was wrapping up, but Lowell came up empty as well. At the 9 minute mark Lowell had about 17 shots and Manchester 9. The Monarchs would spend the period much more even with Lowell after the first period leaning Devils in the momentum category and they killed another penalty. Lowell picked up a penalty of their own when Matt Cohen was called for delay of game at 10:59. The Monarchs took advantage and Oscar Moller scored assisted by M23 and Martinez at 12:08. Play continued until 14:20 when Prough was called for hooking. During the power play Frazee fought off numerous Manchester attacks. With about 5 left in the period Lowell was at 20 shots and Manchester 11. Manchester’s persistence reaped rewards at 14:57 when Moller scored assisted by Piskula and Viatcheslav Voynov. Meanwhile Louis Robitaille was getting into it with Piskula and Bagnall, raising tensions between the two sides. The two sides continued to go at it until John Zeiler was called for hooking at 18:40 giving Lowell a power play which they utilized at 19:53 when Zharkov scored assisted by Taormina and Patrick Davis. The period soon came to a close tied at 3, with Lowell at 25 points and Manchester at 17. Period 3 of the tie game opened with Manchester quickly down a man as Loktionov was called for hooking at 00:25. Lowell made them pay for it when at 1:04 Ben Walter put it in the net, with assists from Perkovich and Michael Swift. Manchester roared back and thought they had scored, but the net had been knocked off the moorings prior and no goal was called. The Monarchs ended up in the penalty box again as Andrew Campbell was called for holding at 4:26. Lowell went on the attack again but their power play resulted in no points. The game progressed and 7 minutes in the Devils had 28 shots and Manchester 17. The Devils avoided a close call when Moller caught them during a line change and zoomed in on goal, but he didn’t score. Magnan was called for cross checking at 11:28 and Manchester went on the power play including shots from Voynov and Corey Elkins but the home team killed the penalty. At 16:08 Perkovich scored with an assist from Zharkov to really put the Monarchs in a hole. The visitors pulled the goalie within the two minute mark but it didn’t help and the game closed out with the Devils winning 5 to 3, with ending shots on goal 32 to 20.